Convert MPEG/MPEG-1/MPEG-2/ to MP4 and other 1000+ video formats without losing quality. Edit MPEG files with trimming, cropping, rotating, watermarks, effects, subtitles, etc. Burn MPEG videos to playable DVD with free menu templates on Windows/Mac. Versatile toolbox combines Video Compress, Video Download, GIF Maker, Fix Media Metadata, etc. 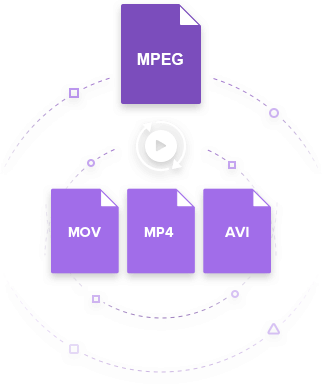 MPEG, short for Moving Picture Experts Group, is a family of digital video compression standards and the formats of the file which is developed by the group. As compared to other formats, MPEG produces video files that are of better quality. MPEG-1 and MPEG 2 are the popular formats of the group. MP4, referred to as MPEG-4 AVC, is basically an abbreviation of MPEG-4 Part 14 and stands for Advanced Video Coding and is also a part of the MPEG group. The MP4 can also be considered as a container format which enables the user to have a combination of video, audio, still images ad subtitles in one file. If you wish to transfer a MPEG video file present on your system to your iPhone or an iPod, then you can read the following parts to know how to convert MPEG to MP4 with best and free online ways. 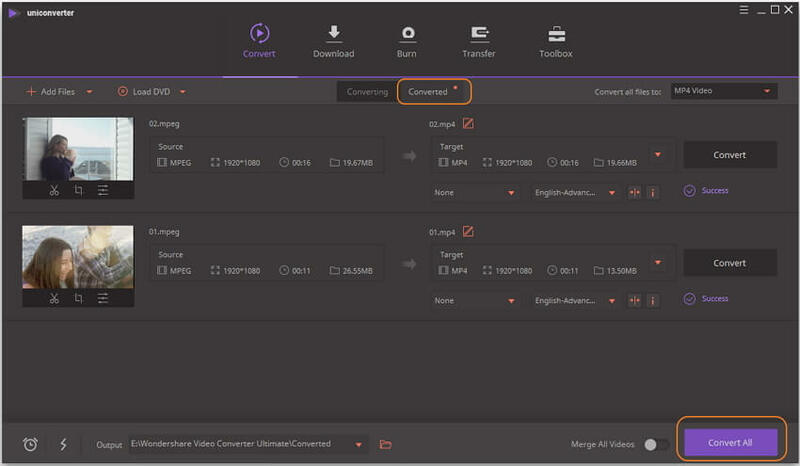 Although there are many video converters available on the market for MPEG to MP4 conversion, Wondershare UniConverter (originally Wondershare Video Converter Ultimate) will surely prove to be the best MPEG to MP4 converter. This wonderful software not only converts videos to over 1000 formats but performs many other functions like editing, downloading, burning and recording videos. It also considers all video conversion needs by providing both Windows and Mac versions. Here lists some key features of Wondershare UniConverter for your reference. Convert MPEG/MPEG-1/MPEG-2 to MP4, AVI, MKV, MOV and other 1000+ video formats. Edit, enhance & personalize your MPEG videos by trimming, cropping, rotating, watermarks, effects, etc. Burn MPEG files to DVD and customize your DVD with free DVD menu templates. Download or record videos from 10,000 video sharing sites and convert to MP4. Download and install Wondershare UniConverter on your PC/Mac first. Below are the detailed steps to convert MPEG/MPEG-1/MPEG-2 to MP4 using Wondershare UniConverter, we'll take the Windows version as example and Mac users can follow the similar steps too. Step 1 Launch Wondershare MPEG converter and Add Files. Launch Wondershare UniConverter and you'll come to the Convert interface by default. Now, click the Add Files button to add the files that you want to convert. Alternatively, you can also drag and drop the files. (Select the MPEG file present on your system that you want to convert). Step 2 Select the output format as MP4. Click the drop-down icon beside the Convert all files to: option, and select Video > MP4 as your desired output format. You can trim, crop, rotate, or add watermarks to the video by clicking the edit icons on the thumbnail. Step 3 Convert MPEG/MPEG-1/MPEG-2 to MP4. Once the output format is selected, click the Convert All button that will start the process of MPEG to MP4 conversion. After the successful conversion, you can find the MPEG files in the Converted tab or click the Output icon at the Converting interface. Fast conversion speed: The software makes use of the latest technology and thus has super fast conversion speed. 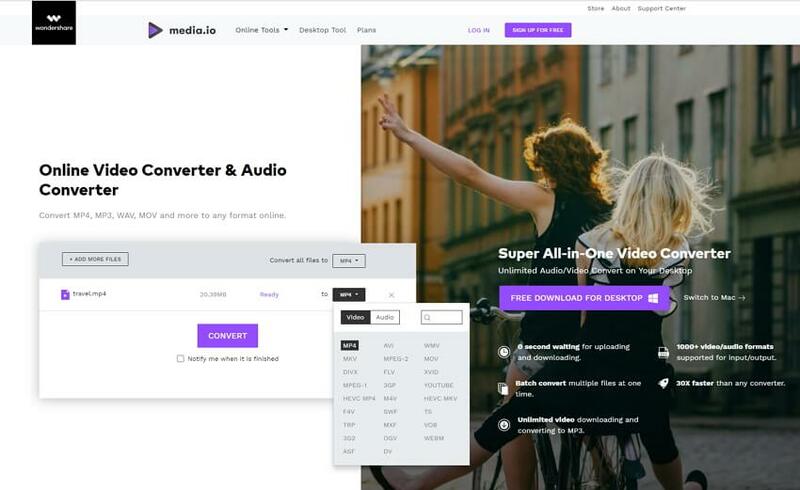 Supports multiple formats: The software is compatible with the majority of the formats including MPEG, Flash, AVI, MP4, 3GP, YouTube and others. High Quality: Though the software is free to use but it does not compromise on the quality and the conversion is of high quality to offer great video experience. Comes with editing features: Along with conversion, the software also allows video editing features like trimming, adding subtitles and watermarks, resetting size and others so as to enhance your overall experience. Secure and full support: The software is completely secure and also comes with 24/7 support. Step 1: Launch Wondershare Free Video Converter on your Mac. 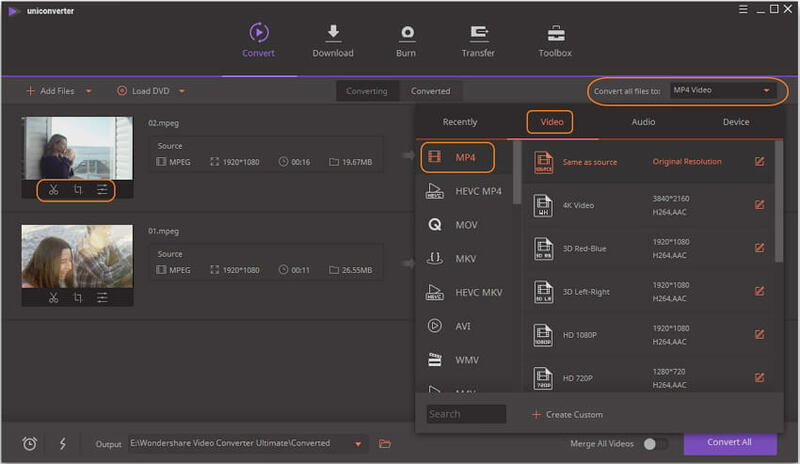 Next, add the MPEG files that you want to convert by clicking on the Add Files option and then select the MPEG file from the specific location. You can also drag and drop the files that need to be converted. Step 2: Now, on the right side of the software, click on the Convert all tasks to: option to select MP4 or other output formats from the list. Step 3: Finally, you need to click on the Convert All button to convert MPEG to MP4 for free. Once the conversion process is over, the software will show the status. Online UniConverter (originally Media.io) is the best website to convert MPEG to MP4 online and free. It can easily convert MPEG/MPEG-1/MPEG-2 files to MP4 within 3 simple steps, 2 files can be converted once a time. This online MPEG to MP4 converter also supports convert most common audio formats like MP3, WAV, M4V, FLAC, etc. Online UniConverter is totally free to use and without any watermark or ads on your video. Just open it from your browser and follow the simple steps below. 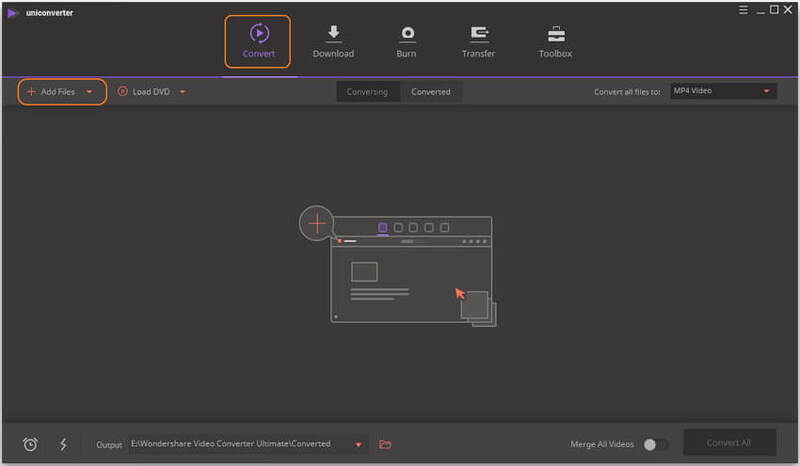 Step 1: Open Online UniConverter (https://www.media.io/) from your Windows/Mac browser, and click the Drag & Drop or Hit to Add File button to select the MPEG video you want to convert to MP4. Step 2: Choose the output format by opening the drop-down list next to the to option, and select MP4 from the Video section. Step 3: After that, click the CONVERT button to convert MPEG file to MP4 online and free. You can download the converted file directly or save it to Dropbox after the quick conversion process. MPEG: Moving Picture Experts Group (MPEG) is a group of experts formed by IEC and ISO so as to set the audio and video compression and transmission standards. Also pronounced as m-peg, MPEG can also be termed as family digital video compression standards as well as file formats by the group. As compared to other competing formats like QuickTime, Indeo and others, MPEG produced better quality videos. The algorithms of MPEG compress the data so as to form it in small bits which can be transmitted easily and can then be decompressed. The major standards of MPEG include MPEG-1, MPEG2, MPEG-3 and MPEG-4. MPEG-1: This standard of MPEG provides the video resolution of 352 by 240 at 30fps and this standard is for the lossy compression of the audios and videos. MPEG-1 is designed in order to compress the raw digital videos of VHS-quality and the CD audio to 1.5Mbit without any loss of excessive quality. The format produces the videos that have the quality which is slightly below the conventional VCR videos. The format thus makes the digital audio broadcasting possible. MPEG-2: The MPEG-2 is mainly used as the format of the digital TV signals which are broadcast by cable, terrestrial and direct broadcast satellite TV. This format is sufficient for all the main standards of TV including HDTV and NTSC. The format is also used to specify the movies and other program formats which are distributed on DVD and other discs. Thus TV receivers, TV stations, DVD players and other devices are designed as per MPEG-2 standard. Thus it can be concluded that MPEG-2 is the successor or the MPEG-1 format and has better quality. MPEG-1 is basically used for the VCD whereas the MPEG-2 standard is used for DVD. In terms of encoding algorithm though MPEG-2 is more complex but it uses high and variable bitrates and also features high resolution.